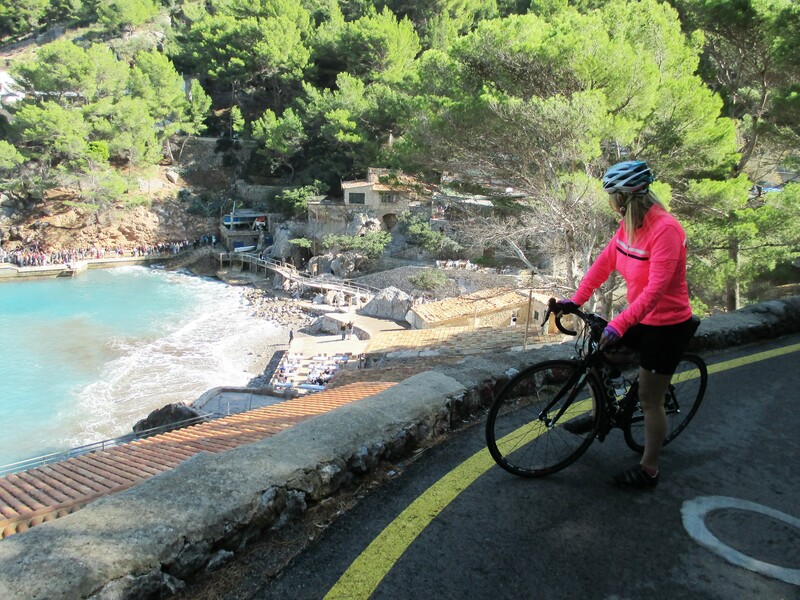 It felt freezing cold as we Parked at Lluc monastery and got ready for the famous cycle ride ahead of us. Pleased to have brought warmer gear, it was certainly needed. The mist in the mountain tops looked menacing, once on the bike it started to clear and we made our way along the pretty pine tree road to the start of the Sa calabra. Looking down into the valleys below, solitary villas sitting proudly with poplar trees making you feel that you were in the Tuscan hills. A Cafe sits at the top, fresh Orange juice advertised for the weary but happy cyclist. A warning sign states heavy coach traffic between 1pm and 3pm. I look at the time, shucks it’s just turning one. 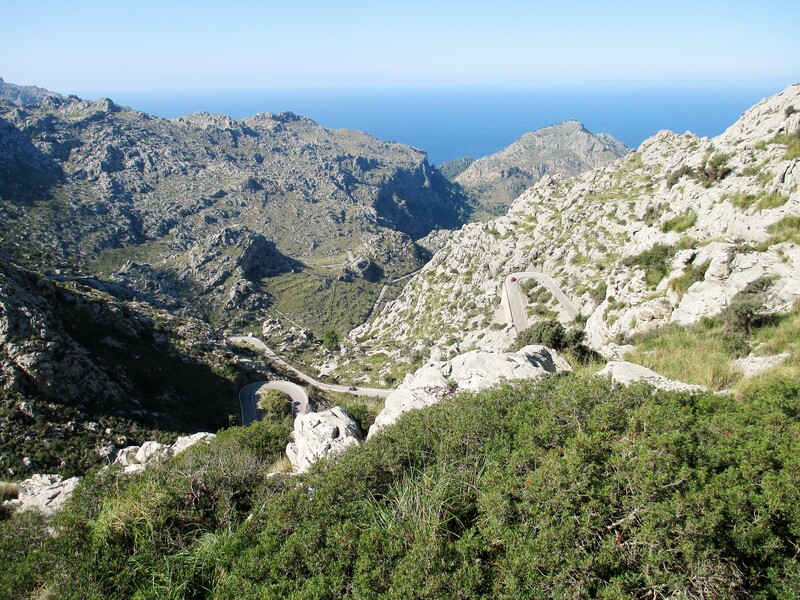 We head off down, that becomes an accent for 2kms passing a sign that declares we are on the scariest mountain cycle ride in Majorca. 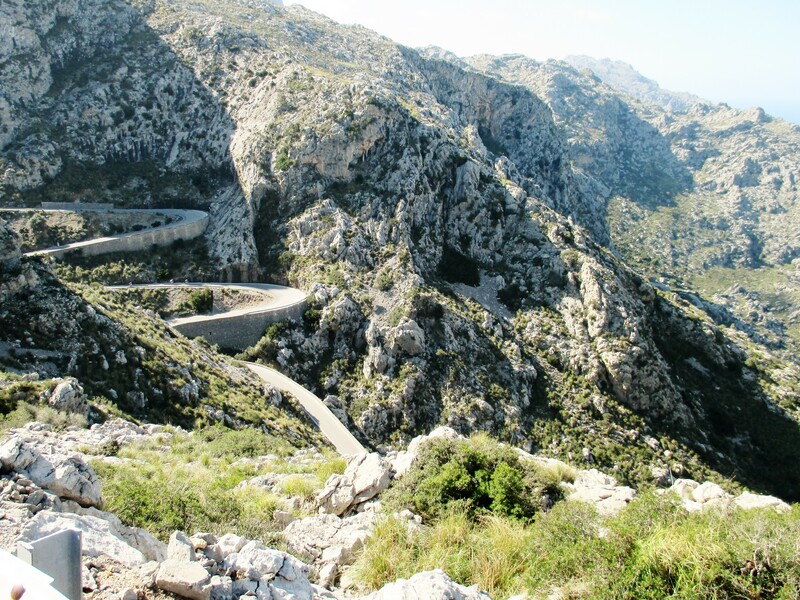 Twenty six beautiful hairpins a sheer construction nightmare but a road to be marvelled at clinging the the mountain side. My brakes just held all the way down to the tiny port with its registered flocks of tourist and bobbing boats on the choppy sea. 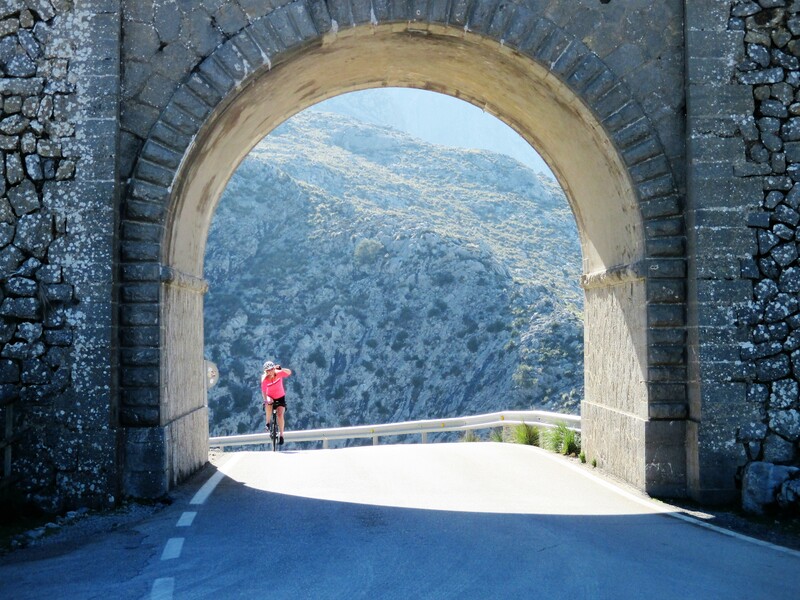 We didn’t linger long, the ride was beckoning and the coaches were starting to queue. Once a steady rhythm was found the ride was a total delight, the scenery wipes all thoughts of aching legs away. With so much to see around every corner, a photographer, must dream about such a road. 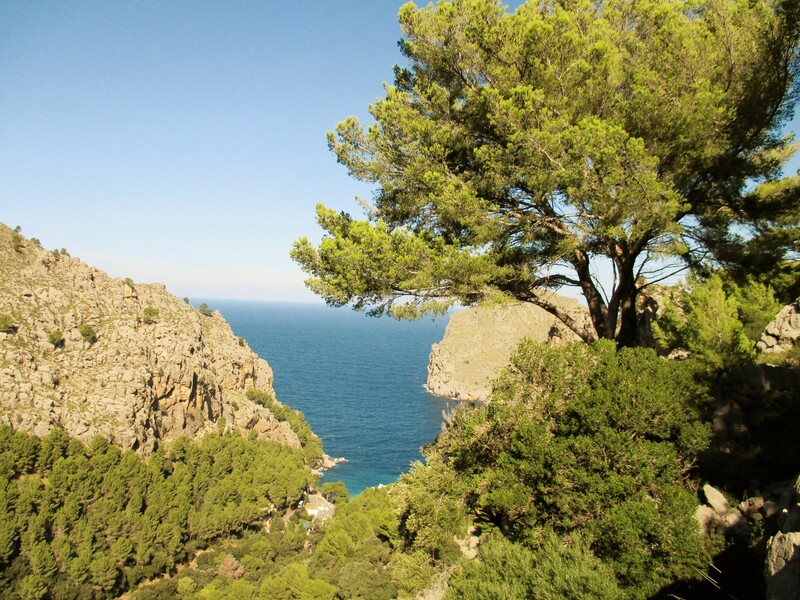 Bright turquoise sea, Cobalt sky, mountain goats strutting on the Ochre boulders and with towering clifftops. 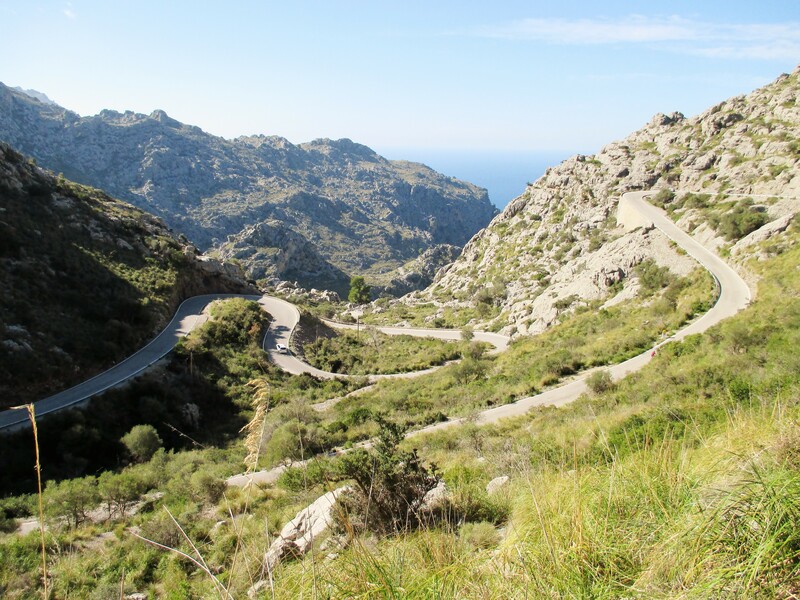 A few hairpins at 11 degrees with a compact gear system all was ok but mainly a steady 7 degrees. The cafe was reached not in a super fast time like a sky rider in around 30 minutes , freshly cut Orange and a can of coke replenished our tired legs and set us on the way along the cliff top rode back to Lluc. 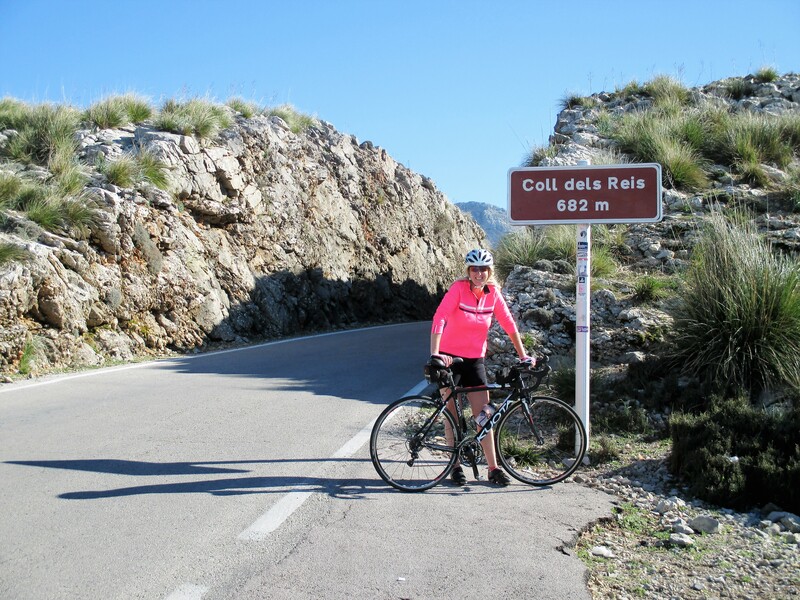 Image | This entry was posted in Cols under 1500 m, Spain and tagged Majorca, Majorca cycling, Sa Calobra. Bookmark the permalink.